Panorama, the flagship database application from ProVUE Development (also known as Jim Rea to its friends), has an amazing history. It was one of the first Mac applications, back in 1984—and even that wasn’t its earliest incarnation. It has been going strong on Mac ever since (and, more recently, on Windows as well). Some people think it’s the best database program there is; I’m one of them, as you’ll discover if you read “Seeing the Light with Panorama” (19 November 2001). TidBITS Publisher Adam Engst is a fan too, and a serious user; see “When You Need a Panoramic View” (14 March 2005) and “An Unusual Use for Panorama” (11 April 2005). And if you like history and nostalgia, be sure to watch Jim Rea being interviewed at Macworld Expo 2010. The data sheet is a spreadsheet-like grid showing all the data in your document. Each row is a record, each column is a field. Forms present the same data in a graphical layout, often one record at a time. A form can be a nicely formatted presentation of the data, but it can also include configurable interface widgets such as buttons and menus, so designing a form is like building an application dedicated to the display and manipulation of this data. Underneath everything is a powerful procedural programming language. Using this programming language, you really are building an application. In fact, much of Panorama itself is written in Panorama’s own programming language. The inspiration of ProVUE’s newly released Panorama Sheets is an acknowledgment that these levels really are largely distinct, each one sitting coherently on top of the next. Many users, perhaps the majority of users, don’t need to encounter all three levels. I myself spend my time in Panorama almost entirely at the first level, in the data sheet. This means that you could take away my access to the second and third levels and I’d barely notice. And that’s exactly what Panorama Sheets is: it’s the data sheet part of Panorama, all by itself. This is a great idea, because it means that suddenly Panorama, in the form of Panorama Sheets, isn’t a big complicated application any more. It’s clear and simple. It isn’t scary or confusing. There’s just about no learning curve. It’s also extremely inviting. Many people who think “database” don’t need programmability or even forms; they just want a grid to store columnar data—an address book, their usernames and passwords, a list of plant diseases, whatever. 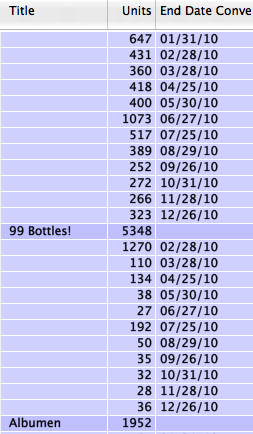 Panorama Sheets owes a lot to Panorama 6, which emerged in the first half of 2010 (see “Panorama 6.0.0 build 92277,” 14 July 2010). Panorama 6 had a few great new features, such as a global Undo that lets you revert to any earlier saved version of a database, but it was centered mostly around an extraordinarily extensive overhaul of Panorama’s interface. Things that were clunky or arcane became clear and straightforward. The menus were vastly simplified, and the data sheet itself was supplemented with contextual menus that let you perform helpful tasks like limiting the displayed records to those that were in some way like the data you were clicking. Wonderful dialogs were introduced to provide assistance for lots of basic operations. So, for example, instead of configuring the database’s field structure in the separate “design sheet,” you just use a contextual menu to add a field, and a dialog to configure it. Instead of writing a formula to base a field’s contents on another (a Full Name column built from a First Name column and a Last Name column, for example), or to manipulate the data in a column (such as stripping off trailing blanks), you describe graphically what you want done, with pop-up menus, in a dialog. Panorama is so fast that it previews the results of that dialog, live, as you configure it; so you know what you’re going to get before you get it. At the same time, if you want to use formulas, you can. The vast power of Panorama’s hundreds of data-manipulation functions and expressions is still there in Panorama Sheets. So, for instance, if you want a column to depend automatically on other columns, in accordance with a complex custom formula, as in a spreadsheet, you can do it. You just can’t combine those formulas with logic in a procedure, which for most people will be a small loss. Panorama Sheets is a great place just to store and analyze data, especially now that it has simple one-step import and export. For example, I use it to keep track of App Store downloads of the iPhone and iPad apps I’ve written. Each week, I get a text file from Apple listing those downloads; I just drag that text file directly onto my Panorama document, and the new data is appended. The real fun starts, though, when you manipulate that data. Panorama is, and has always been, RAM-based; so your file is read once completely into memory and isn’t affected unless you explicitly save (a fact which encourages experimentation, and even if you do save, its Total Recall feature lets you revert to previously saved versions if you messed up), and everything you do is lightning-fast. You can fill a column with data, possibly based on other columns. 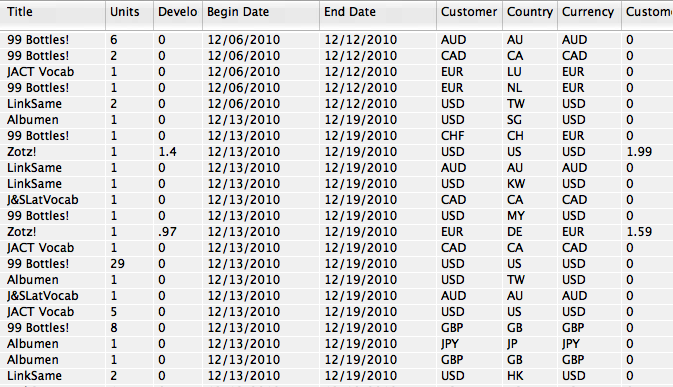 You can propagate data into blank cells, and generate running totals. You can search in all kinds of ways, winnowing the data displayed to what matches your criteria, including finding duplicates. Of course you can sort and subsort. Some of these capabilities might be available in Excel, but they’re nowhere near as easy to use. But the feature I love most is when Panorama analyzes and summarizes your data for you. For example, with a single dialog I can tell Panorama Sheets to show me my App Store data organized to reflect the total downloads for each individual app. Or I can subdivide those totals into date ranges, to see how the number of downloads varies over time. Notice how the irrelevant columns have been hidden automatically, so I can focus on the facts I care about. If you start using Panorama Sheets and eventually decide you really need the full-fledged Panorama, to get forms and the procedural programming language, that’s no problem; Panorama and Panorama Sheets operate on the same documents, and indeed can coexist perfectly on the same computer, and of course you get a special rate if you upgrade. But I don’t want to misrepresent Panorama Sheets as a mere tease, or as some sort of weak Panorama Lite. For most users, Panorama Sheets will be all that’s needed; its lower price and focused feature set, along with the clarified, helpful interface inherited from Panorama 6, make this a powerhouse database program that’s fun and easy to use. The best way to get a sense of Panorama Sheets in action is to watch the introductory video. Then, if you like, you can download the 15-day trial. Panorama Sheets requires an Intel- or PowerPC-based Mac with Mac OS X 10.4 or later; but to buy it from the Mac App Store requires a computer that sees the Mac App Store, meaning it’s running at least Mac OS X 10.6.6. Panorama Sheets costs $39.95 either directly from ProVUE or from the Mac App Store. This looks really interesting, and I'd like to watch the video. Unfortunately, I can't get it to load. Just a temporary thing because of interest generated by this article? Works fine for me. You do have to ask the video to start. And of course if you're using Click-To-Flash you may have to take special measures. I fell away because I didn't need it and the features in later versions were daunting. I may well try this out in a couple of months. Looks really interesting, I do need to have access to data via iPad (preferable) or iPhone, but can't see any reference to apps for this. Matt, I've invested in your opinions over the years. I mean really invested my dollars, and you're views are stellar. I'm sure they don't work for everybody, but it's like a film reviewer who absolutely nails what I want. In this case I've decided to upgrade from Pan5.5 to 6.x. I've been invested since the mid-90's, and it's been one of the best adjuncts I've had to living my computer-life.